Rely on the experience of the Sea Foam tech experts to help you with the most common, time-tested recommendations for using TRANS TUNE in transmissions, hydraulics and power steering systems. How do I add Trans Tune to my automatic transmission? Slowly pour Trans Tune into the transmission dipstick tube using a funnel. For PRE-FLUSHING old fluid, add up to 1 (one) can of Trans Tune depending on your vehicle’s transmission fluid level, then drive 5 to 100 miles before replacing your transmission fluid. For CLEANING or treating driveability/shifting problems, you can add up to one can at any time depending on fluid level. Trans Tune will continue to work for the life of the fluid! 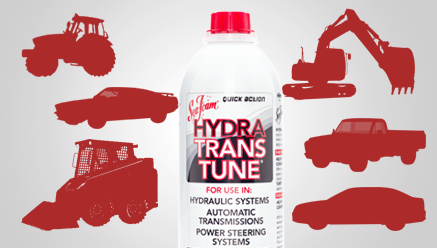 When added to transmission fluid, Hydra Trans Tune helps to control moisture, lubricates, and works quickly to dissolve sticky gum and varnish deposits that cause erratic shifting. Trans Tune only contains petroleum-based ingredients and CANNOT HARM your fluid systems. How do I add Trans Tune to hydraulic fluid? Trans Tune will help to control moisture in fluid, and clean varnish residues from hydraulic valves. How do I add Trans Tune to a power steering system? As a fluid CONDITIONER, add 4 to 6 ounces of Trans Tune to steering fluid reservoir to clean and condition system parts for the life of the fluid. Can be used to overcome hard steering and noisy steering pumps caused by varnish deposits in pumps, gears and pressure valves.